My sister got married this weekend, and of course my dad was in town. The wedding was in the afternoon which gave me a few hours to take him on a 10 miler in Forest Park. I didn't want to do anything too hilly, since 100 feet is a good hill around his house. We did one of our standard Thurman / Leif / Wildwood loops. He absolutely loved it and totally understood why Susan and I raved about Forest Park all the time. I wish he was staying in town longer so I could of taken him to the other end of the park, which is our favorite. But I have to save something for his next visit! If weren't already planning on running 26 a few days before this, I would be really tempted to run it. Maybe next year! Last weekend I went to Michigan to visit my dad and family. My dad and I always run together when I come to visit, I told him this time I wanted to do a 20 mile trail run with him. He lives on Gun Lake which has quite a few good running trails around it, but I wasn't sure if there was 20 miles worth of trails. My dad said that we would be running on the North Country Trail. 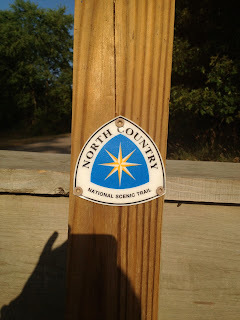 I had never heard of the North Country Trail, living in the Pacific Northwest I am very familiar with the Pacific Crest Trail and of course I know about the Appalachian Trail. The North Country Trail is the longest scenic trail in the US, running across 7 states, totaling over 4,600 miles. Do normal people sign-up for a 50k only 6 weeks from the race date? Well for some reason after our 24 mile run this weekend we thought it would be a good idea. We are now officially signed up for PCT Buncker to Bonneville!